Prepare cake mix according to directions using the eggs, water and oil. Fold in one cup of the bacon crumbles. Using a ice cream scoop, fill a muffin pan (prepared with cupcake liners) 2/3 of the way up with batter. Bake at 325°F for 18-20 minutes until slightly golden brown on top. When done, remove from oven, place on wire rack and let cool. Using a stand mixer (or a bowl and electric mixer) add the cream cheese and butter together and cream until light and fluffy, about 3 minutes. Add bourbon, 2 tablespoons of maple syrup and 1 cup of powdered sugar and beat on low speed. Once powdered sugar is incorporated beat on medium speed. Continue to add powdered sugar one cup at a time until you reach desired frosting consistency. Pipe frosting onto cupcake (or just with knife). Add the remaining 1/2 cup bacon crumbles on top of each cupcake for garnish. Instead of buying the traditional tie this year, why not make something your dad will really appreciate for Father’s Day – Maple Bacon Bourbon Cupcakes! 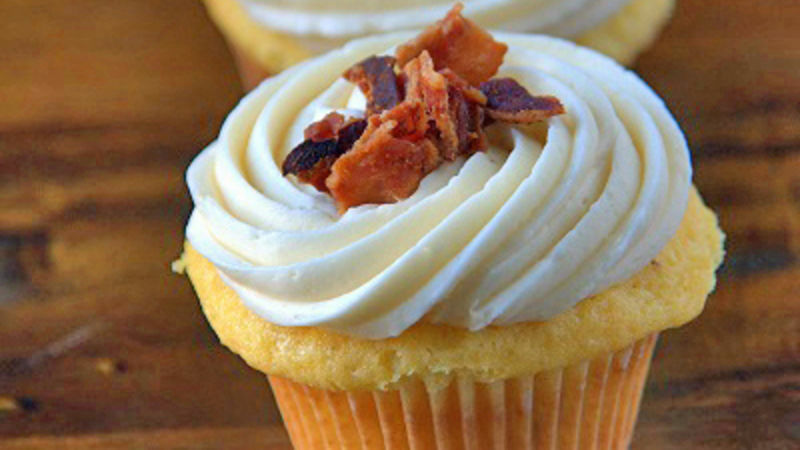 When your dad hears you say bacon and bourbon in one sentence – and then learns it's in cupcake form – he’ll be quite the proud papa. Besides, making anything instead of buying it usually means that much more…it shows you took the time to show dear old dad just what he means to you. Prepare cake mix according to directions using the eggs, water and oil. Fold in one cup of the bacon crumbles. Using an ice cream scoop (nice for portioning), fill a prepared muffin pan 2/3 of the way up (prepared with cupcake liners). Bake at 325F for 18-20 minutes until slightly golden brown on top. When done, remove from oven, place on wire rack and let cool. While the cupcakes are cooling, prepare the frosting. Using a stand mixer (or a bowl and electric mixer) add the cream cheese and butter together and cream until light and fluffy, about three minutes. Add bourbon and 1 cup of powdered sugar and beat on low speed. Once powdered sugar is incorporated beat on medium speed. Continue to add powdered sugar one cup at a time until you reach desired frosting consistency. Pipe frosting onto cupcake (or just use a knife). Bourbon. Bacon. Cupcakes. A sure winner for Father’s Day!